So, this series started last week. 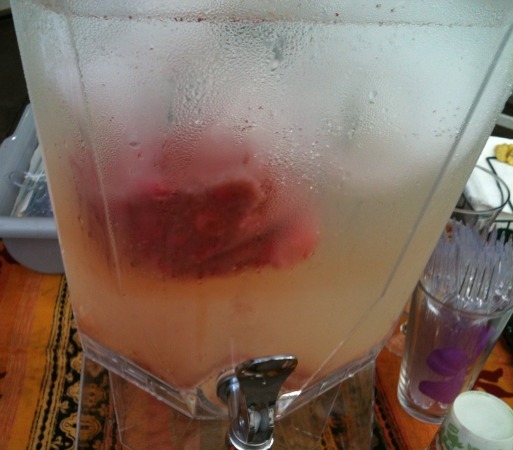 The church kitchen manager adds fruit to the water jug for the congregation. This week was frozen strawberries (and I think pineapple, hard to tell). Dinner was also kinda “brain” related. Sort of “brainish” looking don’t you think? 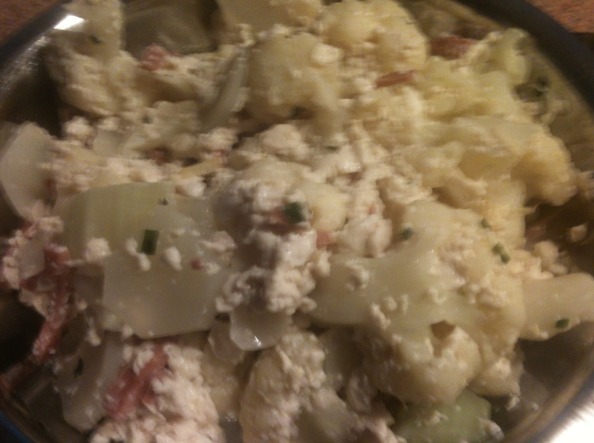 Cauliflower, smashed tofu, a tiny bit of SPAM (for effect), ginger and green onions for taste. Not bad for cooking on the fly. The Cat took the rest for lunch tomorrow. Today’s lunch. You’ve seen this before. 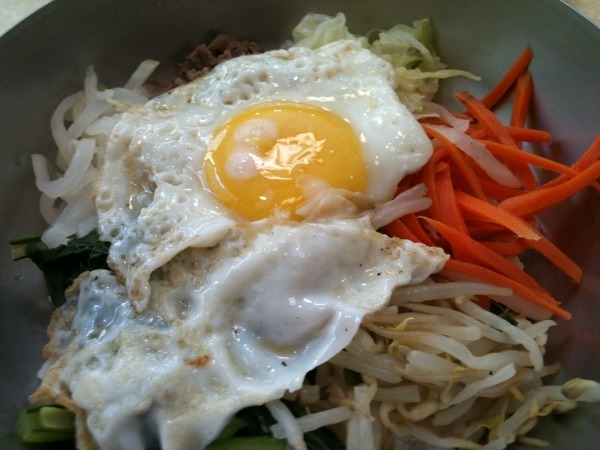 Bibimbap from Chodang. It’s one of the daily specials, used to be $4.99, increased to $5.49, still cheap eats, just not in a stone pot (so no crispy rice bottom). 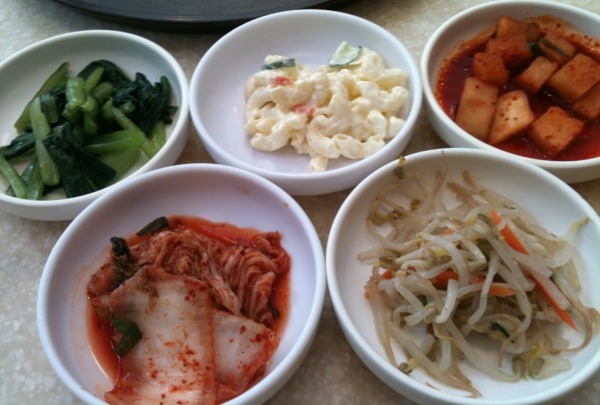 First time I also threw the banchan into the mix too (dunno why I didn’t of this before). 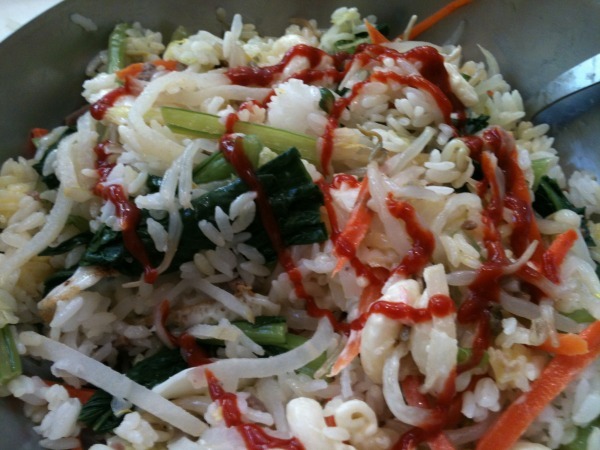 It’s not called “mixed rice for nuthin’. Hee hee! Hope you’re enjoying the long weekend (if you’re so lucky). Recommended by a friend of The Cat. 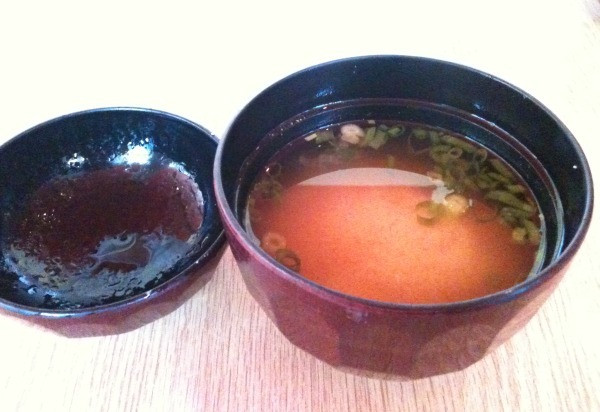 From Shokudo (1585 Kapiolani Boulevard, Honolulu, Hawai’i). Only available for lunch. Sorry to say, did not meet The Cat’s expectations. Not well made. 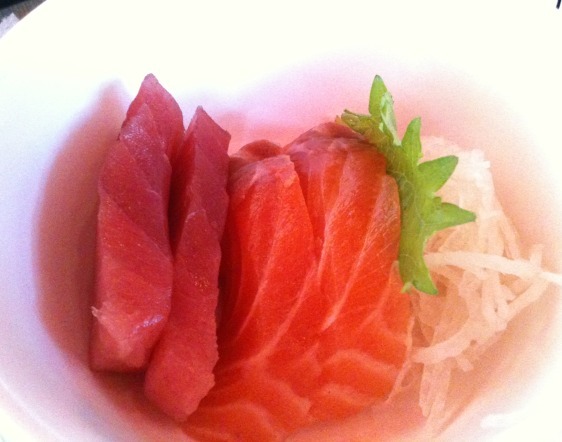 Plus the sashimi was kind of gray (not “healthy” looking). The Cat will be avoiding the place for a while. To give the place credit, they did replace the sushi with “healthier” looking slices. My only “complaint”, the chicken was smeared with a house made spicy tartar sauce, kinda like my fried chicken “nekid”. 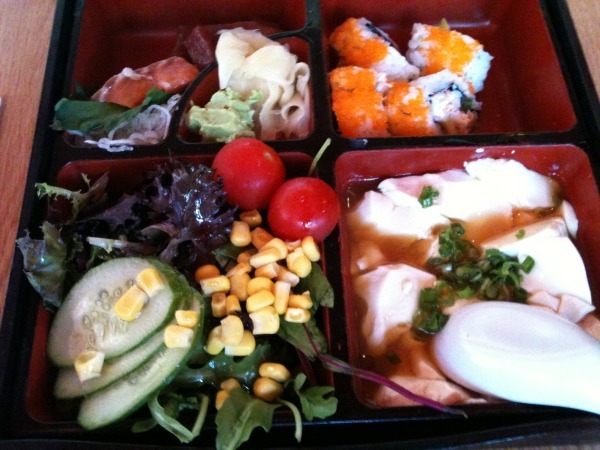 Both bento came with miso soup. Have a nice long weekend (if you are so lucky). Or cleaning out the refrig. 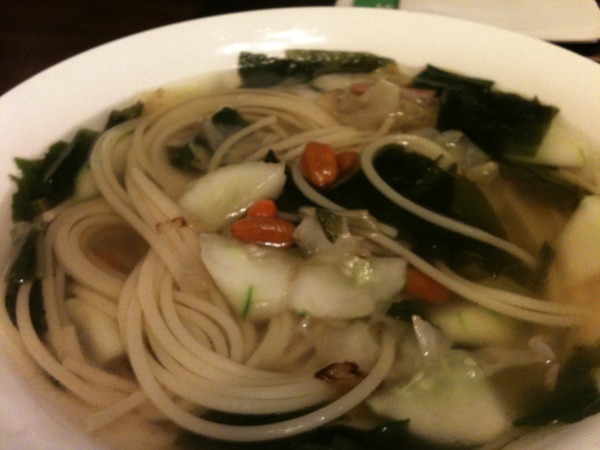 The Cat’s noodles tonight (prepared by The Mouse). Similar to last night’s. Tonight’s noodles had an egg and leftover shoyu pork added. Also, if you look closely, there are two different types of pasta, one noodle length, and one short. Not enough of one, so, a little bit of both. Not much happening today, food-wise. For The Cat. 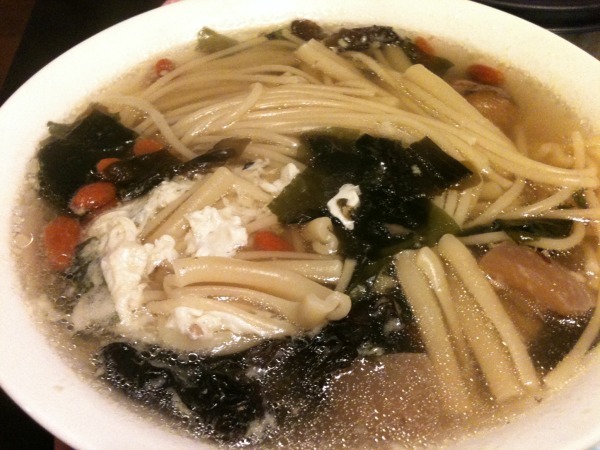 Lunch at Iyo Udon (cheap eats). 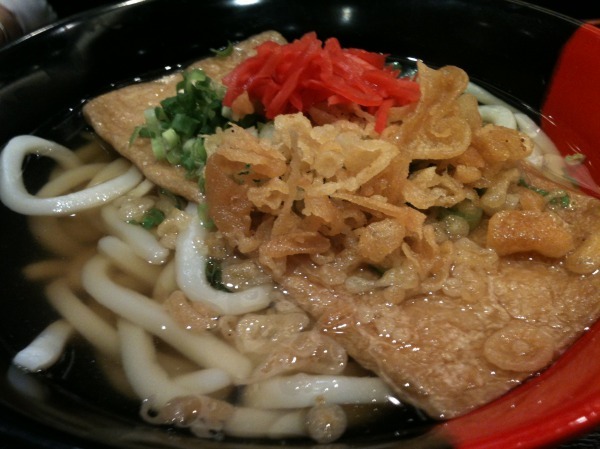 Udon noodles in a hot broth topped with “Kitsune-age” (fried tofu skin). Dinner was one of my “franken-meals”. I guess I still prefer rice. 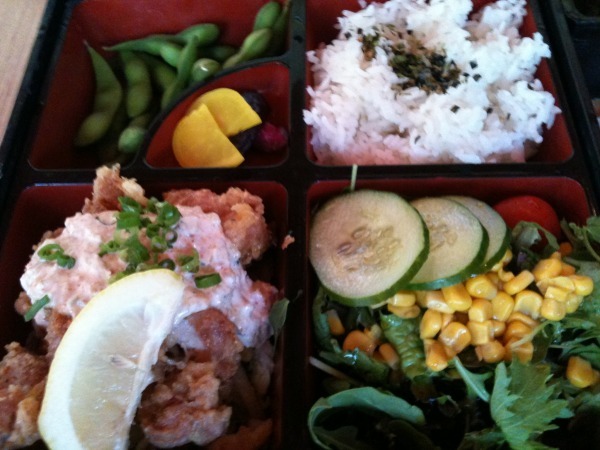 My choices at Iyo Udon? 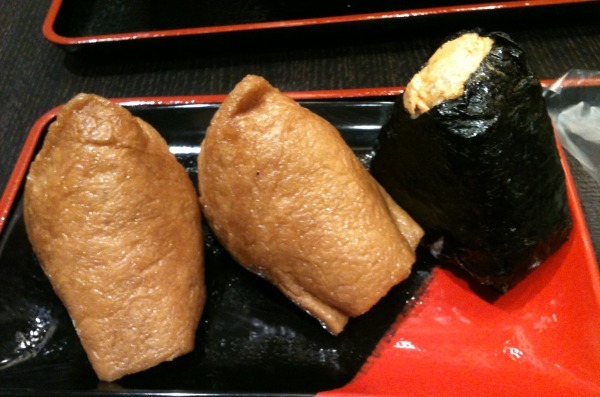 One spicy tuna onigiri and two inari sushi. 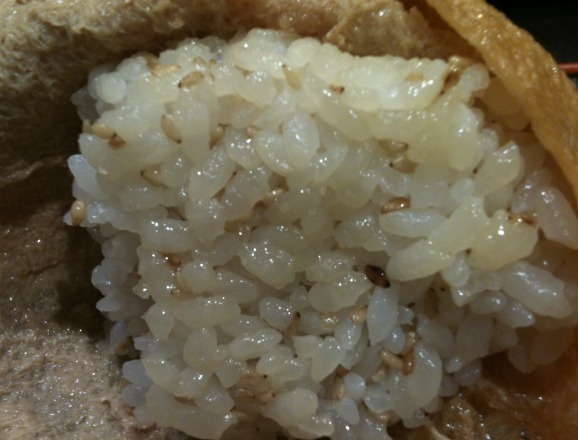 The rice in the inari is different from regular onigiri, vinegar and sugar are added to the salted rice. Oh yeah, and toasted white sesame seeds. Is it me or do the toasted sesame seed look like (use your imagination). Hee hee.